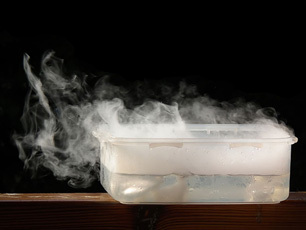 “Dry ice” is the solid form of carbon dioxide. Carbon dioxide is a naturally occurring chemical compound that can be found in most air and natural waters. It's formed by volcanic activity, natural hot springs and geysers, fermentation during beer and winemaking, leavening agents in baked goods, and as a product of cellular respiration in animals. It has uses in many industries. It's used to carbonate beverages, as an ingredient in chemical manufacturing, as a pressurized gas in pneumatic machines, in oil and extraction, as a refrigerant, and as a method of controlling pH in swimming pools. Carbon dioxide is closely related to pH. PH decreases as carbon dioxide content increases and pH goes up as carbonate alkalinity goes up. Carbon dioxide exists at pH levels between 3.6 and 8.4. It cannot be found in water with a pH of 8.5 or higher. Asphyxiation. Caused by the release of carbon dioxide in a confined or unventilated area. This can lower the concentration of oxygen to a level that is immediately dangerous for human health. Frostbite. Solid carbon dioxide is always below -78 °C at regular atmospheric pressure, regardless of the air temperature. Handling this material for more than a second or two without proper protection can cause serious blisters, and other unwanted effects. Carbon dioxide gas released from a steel cylinder, such as a fire extinguisher, causes similar effects. Kidney damage or coma. This is caused by a disturbance in chemical equilibrium of the carbonate buffer. When carbon dioxide concentrations increase or decrease, causing the equilibrium to be disturbed, a life threatening situation may occur. Carbon dioxide can be easily dissipated by aeration. It can also be removed by deionization, or by raising the pH above 8.5 with Soda Ash injection.